One woman on a mental health musical mission, who owes being alive to the music she now performs. 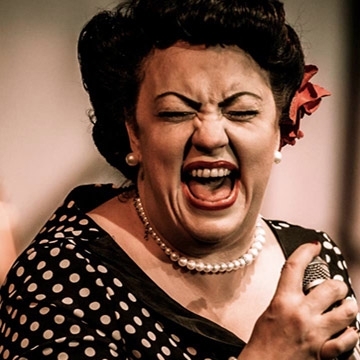 Award-winning Belfast singer-songwriter Kaz Hawkins relaunched as a solo artist in 2018 with her brutally honest piano/vocal show. Kaz has been taking her new ‘non genre’ material on the road in an intimate and personal show about her life. Northern Ireland’s songstress Kaz Hawkins is no longer its best-kept secret with a brand new show, look and mission to reduce the stigma in mental health. Making her name as Belfast Blues Queen the multi-award winning and unique with 'knock your socks off' vocals from an equally delicious firework of a character has now embarked on a new solo career in 2018. Full of life and a stage presence that beckoned being more than solely a songwriter, Kaz’s stellar rise to success will be no surprise to fans around the world she has been wooing for years with her deep, powerful voice, original song writing and soulful tracks. No mean feat for the woman who owes surviving a life of physical and emotional hardship to music. A woman with a larger-than-life personality who doesn’t take setbacks lying down! Described as Northern Ireland’s Soul Superstar after her self penned song dedicated to the childhood she was robbed of. Kaz takes you through her life’s journey in song and it’s an emotional one. With special guest Sam York on piano and as her support act, who has played with luminaries such as Sir Tom Jones, Ed Sheeran, Michael Ball and more. This Goddess – the amazing Kaz Hawkins – accompanied by the great Sam York played at our festival in March 2018, Blues Autour du Zinc. She blew us away…. she has returned to Ireland … and we are forever changed.